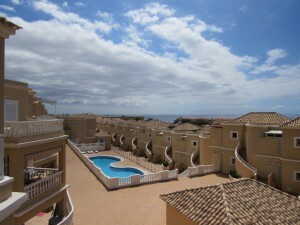 One of our apartments to rent on Benimar in Costa Adeje, Tenerife. The apartment has two bedroom and two bathrooms and has pool and sea views. We stayed on this complex earlier this month and booked through Karen Durant from Holidays4u.org. We really enjoyed our holiday. The apartment we booked was on the 2nd floor. It was in a great location on the complex as it had a sea and pool view. The only niggle is that the pool is not heated, but we knew that before booking, so it is not a complaint. In truth we struggled to find availability on any of the complexes with heated pools. But we didn’t let it spoil our holiday. We still had a fabulous time. One of the best things we enjoyed about the complex is it’s peace and tranquility. The apartment was very well decorated and clean. The balcony had a view of the pool as well as a distant view of the sea. It was especially nice to watch the sunset. We travelled to the beach most days, which was walkable, but most days we just took a taxi which made it very easy. We also took a couple of days out to visit Siam Park and Loro Parque. We especially enjoyed the dolphin show in the latter. The sea lion show was also very amusing. It is great experience and a wonderful day out – we highly recommend it. It isn’t just a zoo the Parque does a lot of important work to protect species which are in danger of extinction.